When I hear the phrase “the glory of God,” various images and words come to mind: unapproachable light and flaming cherubim; man’s chief end and Scripture’s central theme; a bloody cross and an empty tomb. But what is the glory of God, really? What does it mean for God alone to be glorious? If glory belongs to God alone, then how is it that some human beings will share in it? How do we see God’s glory revealed in Scripture’s unfolding storyline? How do we live for his glory today? And what does all this have to do with the Protestant Reformation? All these questions and more are answered in God’s Glory Alone: The Majestic Heart of the Christian Faith and Life. When I heard about The 5 Solas series and saw this volume on soli Deo gloria, one of my first thoughts was Why David VanDrunen? I mean, I like VanDrunen—he’s written some great stuff on natural law and medical ethics. But for a book on the glory of God, why not a more obvious choice, like John Piper? That was when I saw the cover. By page 50, I was no longer asking that question. Following what appears to be the standard layout for the series, the book is structured in three parts: (1) historical theology: what the Reformers taught; (2) exegetical and systematic theology: what the Bible teaches; and (3) practical theology: what we should do about it today. 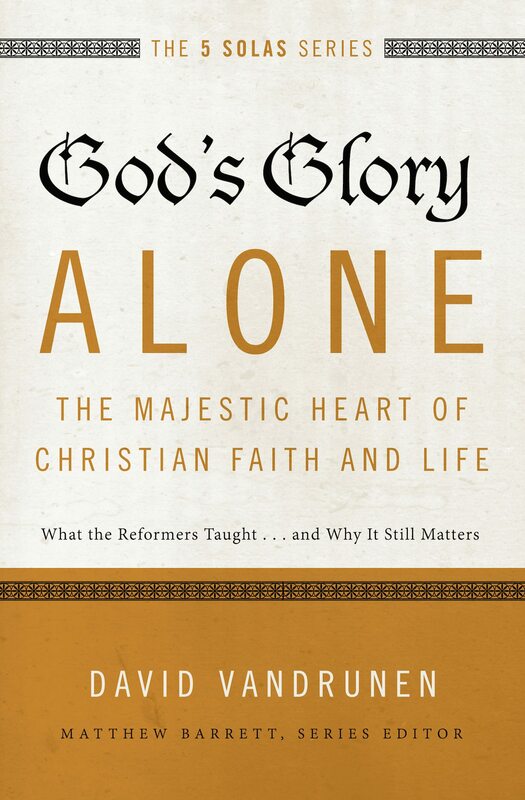 Part 1, “The Glory of God in Reformed Theology,” explores the historical context of soli Deo gloria as one of the Reformation solas. Chapters are dedicated to the teachings of the Reformers and to later Reformed Orthodoxy. Although one could question the propriety of dealing with historical theology before going to the Bible itself—might not such a method endanger sola scriptura by placing undue emphasis on theological tradition?—the order makes sense given that the series is structured around a historical theological rubric (the 5 solas) in honor of a historical event (the Reformation). Besides that, plenty of Scripture is treated in this section, and treated well. Let me briefly mention a couple of highlights. But perhaps the most valuable contribution VanDrunen makes to modern readers is to introduce us to Edward Leigh (28–31). Edwards we know, and Bavink we recognize, but who is Leigh? I suspect this forgotten member of the Westminster Assembly will gain a few more readers thanks to VanDrunen. All we get are snippets from his work A Treatise of Divinity, but enough to reveal a pious and penetrating mind. Part 1 feels like a bit of a slow start. It’s in Part 2, “The Glory of God in Scripture,” that God’s Glory Alone really comes into its own. And this is high praise, given the mammoth task of dealing with a subject many rightly consider the main theme of the whole Bible. “Obviously, there is no single way to unpack a theme so rich and intricate,” VanDrunen confesses, “but I propose to do so primarily by means of a story” (44). Over three chapters he traces that story from Genesis to Revelation, beginning with the triune God’s inherent glory, culminating in God’s glorification of the entire universe crowned by a multitude of his glorified human images—and at the center of it all, “him who for a little while was made lower than the angels, namely Jesus, crowned with glory and honor because of the suffering of death” (Heb. 2:9). VanDrunen’s treatment of the Old Testament theme of the glory cloud is perhaps the most fascinating part of the book (48–63). Watching it guide Israel through the wilderness (Ex. 13:21), seeing it settle on the tabernacle and temple (Ex. 40:34), and witnessing it depart at the exile (Ezek. 10:18–19), you might be surprised at how persistent a theme it is. When systematic theologians are producing biblical theology this good, we’re living in happy times indeed! The final section, “Living for God’s Glory Today,” contains three chapters of contemporary application. Here, VanDrunen examines practical ways we can glorify God, such as prayer, worship, and the fear of God, along with distinctive aspects of our culture that hinder these virtues, such as ubiquitous Internet, information overload, and the culture of selfie-soaked narcissism. I suspect that for many this section will be both the most helpful and the most problematic. The most potentially problematic issue is VanDrunen’s focus on inward piety and corporate worship, coupled with a neglect of cultural engagement. It’s here VanDrunen’s Reformed two kingdoms (R2K) theology comes to the fore (see esp. 155–162). Now I mostly sympathize with VanDrunen’s R2K framework, and I think his exegesis in this section is basically solid, particularly his treatment of the “sojourners and exiles” theme. Further, VanDrunen clearly affirms that as Christians we should glorify God in all we do and be faithful and obedient “in all our callings” (170). At the same time, that’s not where his emphasis lies. When he mentions “cultural agendas” (35), it’s usually not positive. And as to how “glorifying God in our calling” might entail promoting “natural law” in the “common kingdom” (on issues like abortion and marriage, for instance), he is silent. While I don’t wish to criticize him for not writing a different book, in a section on how to live for God’s glory, it seems more could have been said. Even as a sympathizer, I could understand if those who already suspect R2K theology of turning a blind eye to social evil found little here to allay their fears. Still, I regard this section as the most helpful in the entire book, and it would be a fastidious Kuyperian indeed who couldn’t profit from it. The chapter on the distracting power of digital devices is the most balanced treatment of the subject I’ve read. He avoids the ditch of Luddite nostalgia, recognizing that “no evil that seduces us today is brand-new,” while also noting that the challenges the internet poses are “distinct,” even if not “unique” (110). This chapter alone is worth the price of the book, and ought to be useful in discipling millennials. Despite minor shortcomings, for me God’s Glory Alone was like pizza: even at its worst, it’s still pretty good, and at its best, it’s fantastic.